This soup recipe shows that frozen vegetables can be delicious, and choosing to use them will save you a ton of time and energy that is usually spent cleaning and chopping the vegetables. It was cold and rainy out and I wanted hot soup to come home to. I only had a few minutes to prepare something, so I turned to my freezer. Inside, bags of frozen vegetables just waiting to be transformed into a healthy, yet satisfying lunch. For this soup, I grabbed a bag of frozen cajun mirepoix and one of frozen cut green beans. I found the cajun mirepoix at Kroger. It has celery, onion and green pepper. If you cannot find this specific blend, you can substitute a traditional mirepoix with celery, onion and carrot. The soup will survive. Then all I had to do was add a few of my staples, jarred tomato puree, fresh spinach, red wine vinegar and italian seasoning, and my soup was complete. The reason the soup gets so flavorful is the prolonged cooking time. Simmering it for at least an hour allows all the flavors to come together deliciously. Serve it up with a cornbread muffin or two and you have the perfect meal for a dreary fall day. 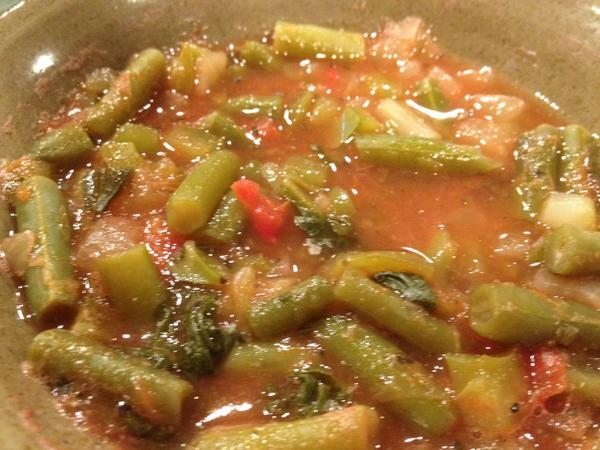 Dump your frozen mirepoix and green bean bags into a large soup pot and cover with water. Add a few shakes of salt and pepper. Bring to a boil and cook three to four minutes. Add spinach leaves, tomato puree, and italian seasoning, and cook another few minutes until the spinach is wilted and the tomatoes are well-incorporated. Then add the red wine vinegar and taste. Add more salt if necessary. Turn the heat to low and allow the soup to simmer at least an hour.